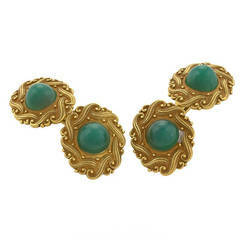 A French Art Nouveau 18 karat gold dress set with a pair of cuff links and three shirt studs by Henri Vever. The intricate Gothic revival, Celtic inspired motif centers on a delicate flower detailing, all completed in varying shades of pink and green pliqu-a-jour enamel. Accompanied by its original box. Circa 1900. Signed, Vever Maker's Mark, French Assay.